We already know about the 3.7-inch Nokia Sea Ray and the Nokia Sabre, and now the Nokia Ace joins that Windows Phone lineup with a 4.3” screen, a 1.4GHz processor and an 8-megapixel camera. In addition, it’s rumored to come to AT&T in Q1 2012, so that’s definitely saying something about Nokia’s intentions for the US. Finally, we should say that we doubt that Ace name - after all, Samsung unveiled the Galaxy Ace not too long ago, so it would be strange to see another Ace so soon. In either case, a Nokia WP device with a 4.3-inch screen definitely fits the current reality of the market and that adds some more weight to this rumor. That is only the code-name. They will change it before its release. That's how it always works. Those carriers that are relying on android as their bread and butter will see alot loss from wp7 users as they will be heading to att next year. id love to move from tmo but stuck with fam plan, as tmo is one of those carriers that havent learned from Motorolas flaw. T-mobile has problems with service coverage areas like in remote areas and the Mall some store has T-mobile service and some don't. The big stores that have no T-mobile service are Macy's and Targets which is hard for me when my wife pick up some clothes and try to call me "call failed". 10 years with Tmo never improve their service coverage. This is fantastic. 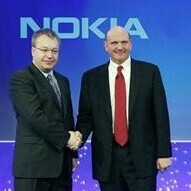 I really, really did not think we would see a Nokia on U.S. soil for a while, like the summer, 2012 buying season. I do not know if I could wait that long for a replacement to my ever-so-dying Palm Pre Plus, but I am very, very interested. one thing you cannot accuse nokia of is that their phone are always complete with features at reasonable price. its their os that killed them. hope this time they get it right. As long as it has that polycarbonite cover and that curved gorilla glass screen. This phone will be mine. It just seems that Sprint has been doing well enough with Android phones and want to focus more on that, same thing with Verizon, I mean they do have that Droid lineup that works incredibly well with them. I like the variety AT&T is providing with their handsets. 16GB is atrocious for such a high end model. I hope they rethink that and add a 32 and 64GB version to the mix.